HP's Pavilion range comprises the majority of its consumer laptops and combines high-end designs with stunning usability and features. Its Pavilion dm3-1020EA is a compact and smartly designed portable that makes a stylish and capable travel partner. At just 1.9kg, it is light and portable and its smooth, curved edges and sleek design let it slip easily into your hand luggage. Its fantastic 276-minute battery life makes it perfect for people who work on the commute, allowing nearly five hours of mobile use. A high-quality look throughout the entire chassis is provided by a combination of black plastics and brushed aluminium. These resilient materials also make it tough and able to withstand the rigours of daily use. This level of quality continues across the user interface. The spacious keyboard delivers fantastic usability via the popular isolated-style design. All keys are firmly attached and move smoothly and accurately. The shiny metallic touchpad and mouse buttons are equally usable. Where the dm3-1020EA really stands out is its bright and vibrant 13.3-inch LED screen. Image quality is stunning, with impressive sharpness and an excellent display of colour and contrast. Its glossy Super-TFT coating is more reflective than we would like, but this is a minor flaw. Graphics performance isn't very good, but this is common with compact laptops such as this. Nevertheless, the integrated ATi graphics card provides ample power for watching movies, playing the most basic games and even photo and video editing. Home and office abilities are less capable. 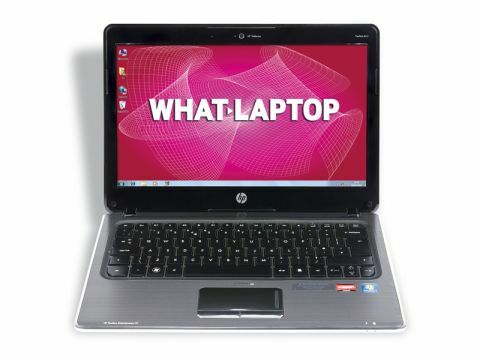 Despite being a dual-core chip, performance is bettered by most other laptops at this price point. You can run most office applications and browse the internet with ease, but don't expect to multi-task with any degree of speed with this machine. Network connectivity is also less capable than we would have liked – or expected – from such a portable device. 802.11g Wi-Fi and 10/100 Ethernet provide average wireless and fixed connection speeds. It should also be noted that, due to the slim chassis, there is no integrated optical disc drive (ODD) for CD or DVD access. An external USB drive is provided for use at home, but you won't be able to pop a disc into the side of this laptop for entertainment on the move. Despite some very minor flaws, the Pavilion dm3-1020EA is nevertheless a stunningly designed, highly usable and eminently portable machine. While its lack of an integrated ODD is unfortunate, this is still a great mobile device and one that is very easy to recommend.